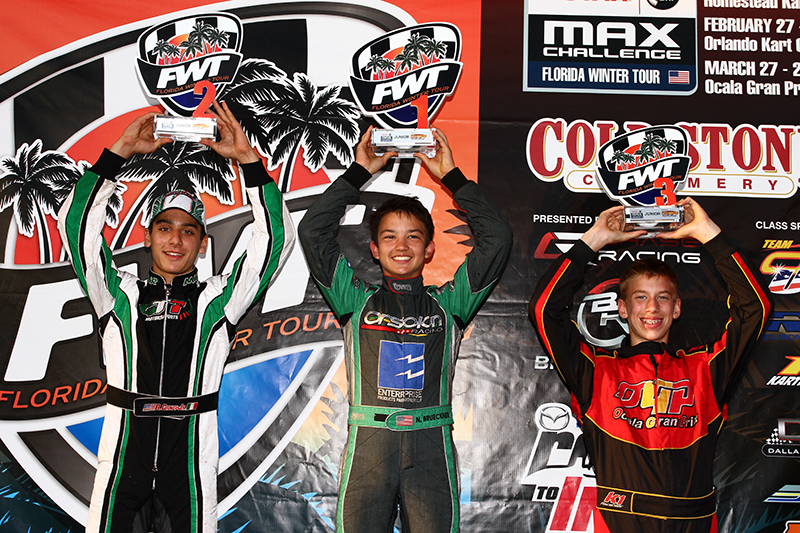 After earning his first victory of 2015 at the first stop of the 2015 Cold Stone Florida Winter Tour, Anthony Gangi Jr. was back on track for two more back-to-back race weekends, this time at the Orlando Kart Center in Orlando, Florida. 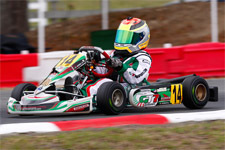 Battling ever-changing weather conditions for the second rounds of both the ROK Cup USA and Rotax MAX Challenge programs, the GT7 Motorsports/Tony Kart pilot would earn two top-tens in ROK Junior and make a return trip to the podium for Rotax Junior. With cooler temperatures in the Orlando area for the beginning of the first weekend, Gangi Jr. and his tuner and driver coach Mike Doty continued to work on their ROK Junior setup. Kicking off official on track sessions with Saturday qualifying, the Brookville, New York resident found himself in the top-ten, placing ninth overall. 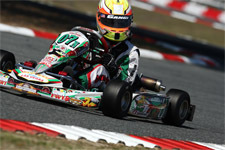 Racing action saw Gangi Jr. fall back to 13th in the prefinal, before the ROK Junior rookie battled back to place in the top-five for the day’s final. 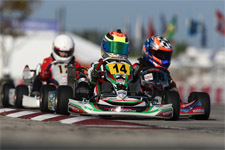 As warmer weather returned for Sunday, Gangi Jr. placed 14th in qualifying before moving up to ninth in the prefinal. Unable to make up any additional spots in the main, the GT7 Motorsports pilot would end his ROK weekend with another top-ten finish. 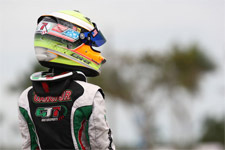 Taking on the more familiar Rotax MAX Challenge the very next weekend, Gangi Jr. would look to continue where he left off from round one. 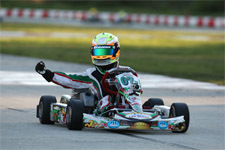 Qualifying for Saturday and Sunday wheel-to-wheel action on Friday, the multi-time karting champion placed third for Sunday, and then upped the ante to score the pole position for Saturday. Challenging track conditions on Saturday, however, prevented Gangi Jr. from capitalizing on his premier starting position. With heavy rain pouring down, the popular driver was involved in an opening lap melee and out of the race on lap one. Sunday was a much better day all around for Gangi Jr. With a dry track, the talented pilot would retain his third place starting position during the prefinal race. Battling for position the final, Gangi Jr. was unable to catch the leader but earned a second place podium result on the day. With one round remaining for each program, Gangi Jr. finds himself fifth in points for ROK Junior and sixth in Rotax Junior. 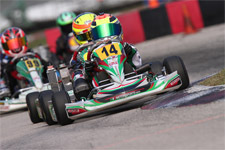 Battling for the class championship titles at the series finale, Gangi Jr. will head to the Ocala Gran Prix in Ocala, Florida this weekend, March 21-22 for ROK, and March 27-29 for Rotax. Anthony Gangi Jr. would like to thank tuner/driving coach Mike Doty of Mike Doty Racing, Chad Brackens of Race Data Dynamics for all the data support, Daniel Lambert (Disco Dan) for the always-great power, Daniel and Gary Woltjer of Woltjer Engines, as well as sponsors GT7 Motorsports, Millwork Solutions, Hole Shot Drive Systems, PKT, and Hot Head Engine Preheaters.